Housecall's having a Hollywood moment! Voting is now open for RISMedia's 3rd Annual Academy Awards of Real Estate, which awards the Oscar for Best Real Estate Client to one of this year's Academy Award nominees—selected by you, members of the real estate industry. 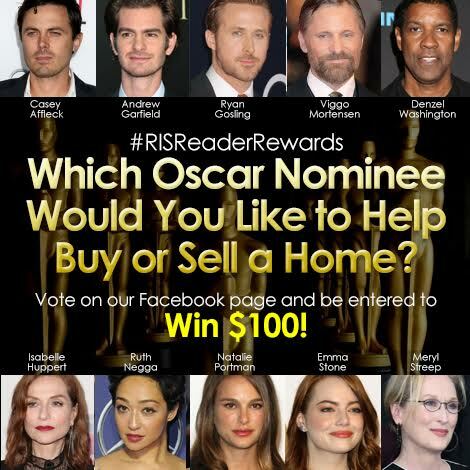 Comment on this Facebook post with your vote for the Academy Award nominee you'd want to help buy or sell a home. All participants will be entered into a #RISReaderRewards drawing for $100! Casey Affleck as I love him and think he would be great to work with and also think he’s intelligent and will listen to expert advise. Meryl Streep ranks right up there as well. I admire her tremendously as an Actor. Meryl Streep. She is articulate, intelligent and works hard at her craft. I love working with amazing women. Casey Affleck, he would be great to work with! Ryan Gosling, fun to work with the Rich and Famous and enjoying what I do Best ! Great answers, everyone! Be sure to Like Housecall on Facebook and post your comment there in order to be officially entered to win the prize money! Emma Stone… She just seems like someone that’s fairly easy to get on with and knows what she wants, which is so important between agent and client.